We like taking pictures of moments that reflect the best of our shared history. Sahana Mukherjee, assistant professor of psychology at Gettysburg College, examines why this can lead to denying injustices of the past. 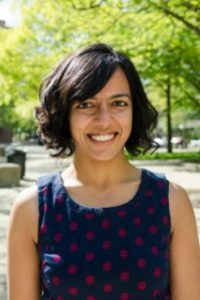 Sahana Mukherjee, assistant professor of psychology at Gettysburg College, is a social and cultural psychologist. Her research interests lie in the bi-directional relationship between psychological experiences (e.g., national identity) and cultural practices and products (e.g., history museums). Professor Mukherjee uses a variety of research methods (e.g., laboratory research, interviews, field research) to conduct research in the US, Canada, and India. A common thread connecting all her projects is the focus on social justice, and she strives towards conducting research that can be used to understand and alleviate social inequalities. How do we remember our nation’s past? When you visit a museum, what do you take photos of? Why? My colleague, Phia Salter and I have examined these questions in the context of America’s immigration history. We went to Ellis Island Immigration Museum at NYC and asked visitors to share 10 photos of exhibits that they considered most important. Our research assistants coded each of the hundred and fourteen photos. People took more photos that reflected nation glorifying themes focusing on positive aspects of immigration history compared to photos that reflected critical themes focusing on historical injustices. We also conducted a lab study and exposed people to an equal number of glorifying, critical, and neutral photos. Our participants preferred the glorifying photos, to the critical ones. And, the more they defined identity in ethnocentric terms (so to be truly American one needs to be Christian, or speak without a foreign accent), the more they preferred the glorifying photos. But how does ethnocentric identity emerge in the first place? To complete the loop, we exposed people to glorifying OR critical photos. Exposure to critical photos led people to deny ethnocentric identity, and also perceive more injustices. However, this happened only when the photos were paired with the American flag. Without the flag, we saw the OPPOSITE effect: critical photos lead people to deny injustices. So, if we want people to recognize current inequalities, we could expose them to past narratives on injustice. But it can be threatening to think about our past in a negative manner, so for now, pairing these narratives with the American flag, may be the way to go.